Mitsubishi celebrated 100 years of making cars in 2017, they also were integrated into the Renault Nissan Alliance, and the company is now known as Renault Nissan Mitsubishi, or RNM. This company is now the largest vehicle producer in the world. In the UK last year Mitsubishi sold 26,500 vehicles, including the ever popular L200 Pick-Up, and the tax-beating Outlander PHEV, Plug-In petrol SUV. 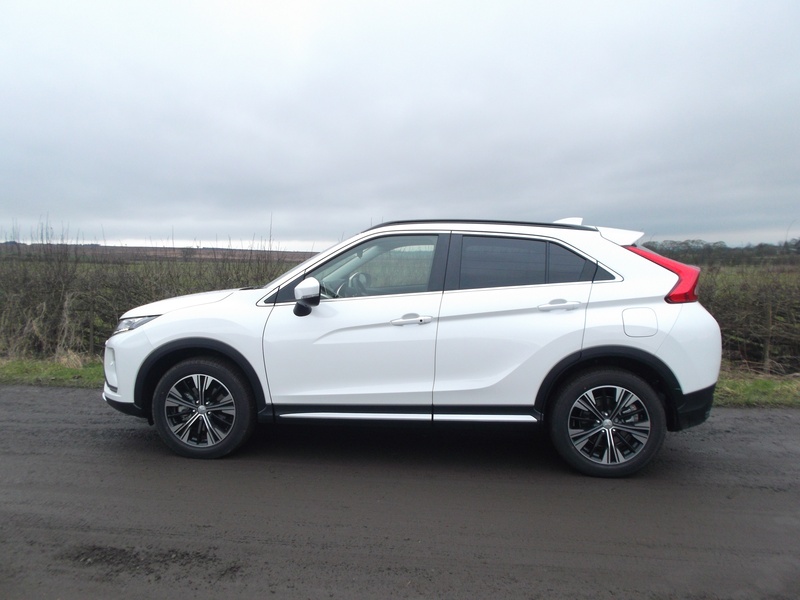 In all the years Mitsubishi have been producing vehicles, it has been in the SUV sector that they have concentrated, and add to that the rugged Pick-Ups, they have in the main, stayed clear of the regular hatches and saloons, and stuck with what they know best. And recently this has paid off, as more and more customers are choosing SUV’s and off-roaders. The all-new Eclipse Cross – not sure why they added Cross into the badging, Eclipse would have been more than adequate, fits well into the current range. It measures 4,405mm long, 1,805mm wide and is 1,685mm high, so all very well in proportion. 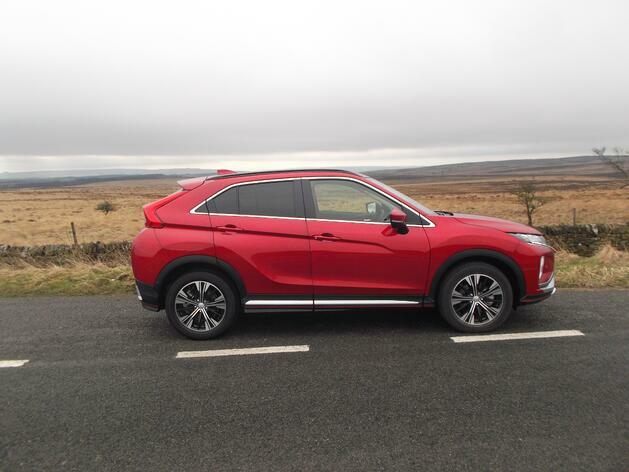 Mitsubishi say their main competitors are: Toyota C-HR, SEAT Ateca, KIA Sportage, Nissan Qashqai and Peugeot 3008, to name just a few in this highly competitive sector of the market. The Eclipse Cross is being launched with just one engine, a 1.5-litre Direct Injection turbo-charged petrol engine that produces 163hp. The 6-speed manual goes from 0-62mph in 10.3 seconds, the CVT auto in 9.3 seconds, and the 4WD Auto in 9.8 seconds. If a customer wants 4WD, then the only option is to buy an Auto. When we were told that the auto gearbox was a CVT, your heart misses a beat, as these gearboxes can be very good, smooth, quick and quiet. Or they can be pretty awful. The first car I took out, and drove from near Bakewell, up into the Peak District, and then the snow covered hills of the Snake Pass was the 6-Speed manual. The engine was lively and quiet, with more than enough power. During the drive which lasted nearly two-hours, I achieved 38.1mpg, which I thought was pretty good for the type of roads, and conditions, and continually going up and down the gears, not like on the motorway where I’m sure the fuel consumption would be better at a more constant speed. The interior is up to a very high standard, with fit and finish, and materials used almost as good as a German Premium saloon. The Japanese have obviously looked at competitors and decided that they are capable of spending a bit more money, and producing a better car. The cabin is very modern with the dash giving the impression it is like a cockpit, with everything in exactly the right place, and so easy to use. It took just a matter of minutes to get to know where all the buttons and switches were, and all very intuitive. The rear seats slide individually by up to 20cm, so the boot size can be increased quite substantially, or slide them back and this gives rear passengers much more legroom, or put them somewhere in the middle for a bit more space for passengers and luggage, a good idea, and although not unique, Mitsubishi have taken the right decision by putting this very nice feature in this car. After lunch it was the turn of the 8-speed CVT Auto, something I was dreading, yet hoping it wasn’t going to be too disappointing. You can just select Auto, and leave it there, or use the ‘’Sport-Mode’’ controlled via the steering wheel paddle shifters, which are quick and responsive. 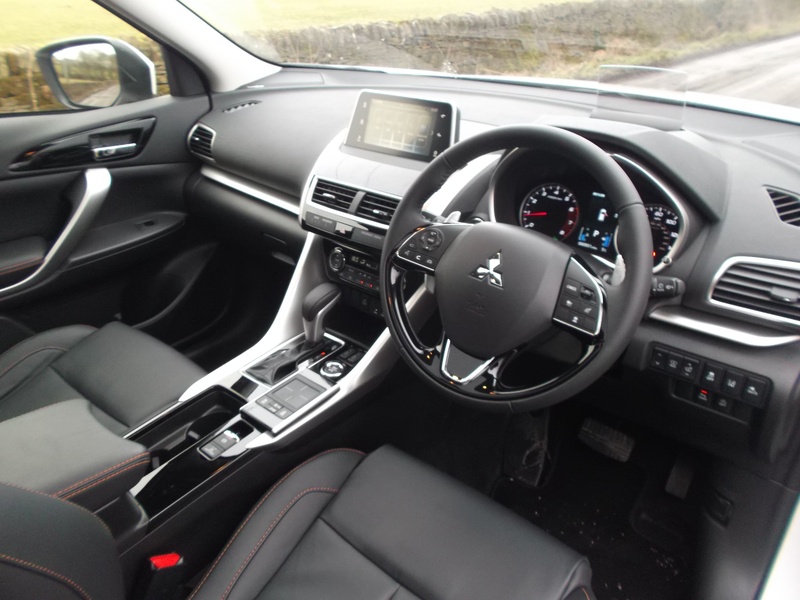 Like the interior the Japanese have looked at other CVT systems, and seen which are good, and which are… not as good. And taken the best, and made it better. The potential disappointment quickly turned to elation, as this CVT wasn’t at all bad, very good really. The exterior design is different and eye-catching and has a bold visual identity. Although it is most definitely a SUV, it does have Coupe-Like styling, and is very attractive. The rear window is split into two sections, which does help reversing, as you do get more visibility. There are four models at launch: 2, 3, 4 and First Edition with prices starting from £21,275 and going up to £29,750 for the First Edition 4WD Auto, but limited to just 250 vehicles for the UK. All models are so well equipped with standard equipment, even to lead-in car, the 2 has alloy wheels, rear view camera, touch-pad controller, cruise control, climate control air conditioning, auto lights with auto high beam, privacy glass, 7 airbags, rear spoiler, Front Collision Mitigation, Lane Departure Warning, and so the list goes on. The 3 and 4 add even more, but unfortunately none have satellite navigation as standard, but instead rely on Apple Car Play and Android Auto. This system uses your phone to download sat-nav or routes direct onto the cars system. And while I agree this technology is improving and getting more popular, in many people’s minds, you still can’t beat the good old sat-nav system, built into the car. 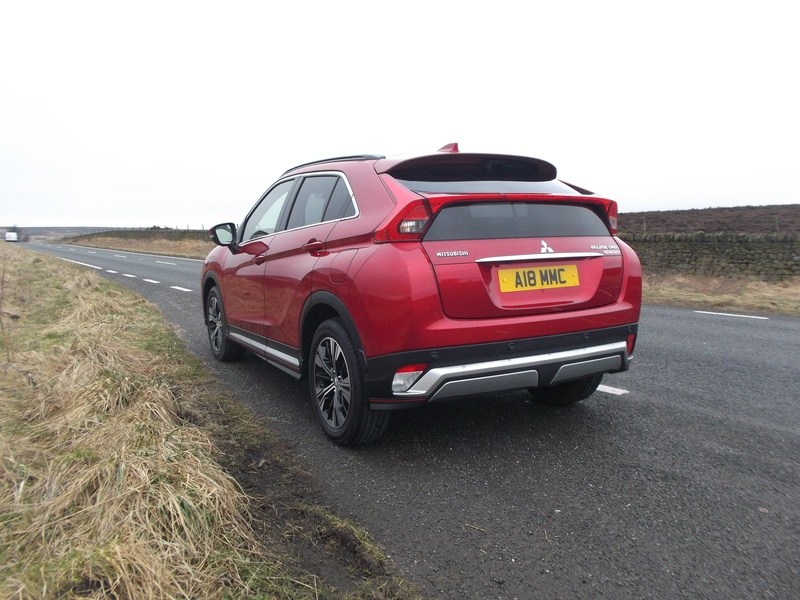 Mitsubishi say that there may be a Diesel version coming, but as yet nothing definite, and this really depends on just how far diesel sales continue to decline, or indeed if they start to make a comeback. But the 1.5 petrol seemed efficient, quick and quiet, and relatively economical.